Using a feature wall can be a great way to add interest to a room, use a bold pattern that has the potential to be over-powering when used on all four walls, or to bring together different elements of a colour scheme. In this article, we look at how to make this popular design feature work effectively to enhance your overall decorative scheme. * If you want to liven up a simple, neutral scheme and create contrast and interest. * If you want to use a particular paper which is either very expensive or which has a pattern which might be over-powering if used on all the walls. * As a way of bringing together a colour scheme – for example, the background colour of your paper could co-ordinate with the other walls, whilst the detail of the pattern might pick up other colours you have used for the accessories in your room such as the curtains, cushions or bed-linen, or decorative touches like pictures and ornaments. 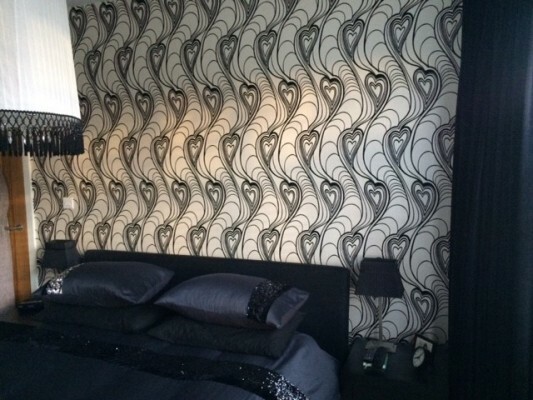 This lovely bedroom in Enfield uses a dramatic black and ivory colour scheme, which gives a bold contemporary feel. An all black wall here would have made the room feel dark and heavy, but we needed a way to bring together the black of the bed linen, small bedside lamps and curtains, with the ivory elements such as the other walls and the large lampshade. The feature wall has a striking and bold monochrome pattern that brings together these different elements, but which could have could have been over-powering if used on all four walls. However, using it for one feature wall provides a striking feature and brings together the other black and ivory elements in the room to give a coherent overall decorative scheme. 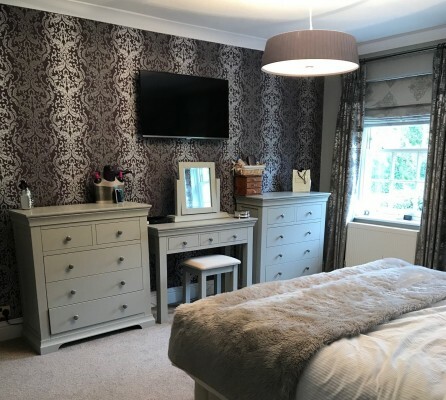 This beautiful bedroom in Arkley has a predominantly neutral palette with carpet, bed-linen and three of the walls in soft, muted, grey tones. The paper on the feature wall has an intricate pattern in complementary metallic silver with a contrasting aubergine colourway. The curtains are in a co-ordinating fabric and the pattern on the blinds echoes that on the wall. A pattern like this could easily be over-powering if used on all four walls, but on one wall it provides contrast and interest which both complements and enlivens the predominantly neutral colour scheme. As an alternative to patterned wallpaper, one wall in a different but complementary colour can be used in a similar way, enabling you to use a colour which you like but which might be over-powering or too dark if used on all four walls. You could also use it to bring together your décor by co-ordinating with different accessories in the room – for example, to match with or complement the curtains around the window on a different wall. Alternatively, a subtle contrast can be created by using wallpaper with a different texture or a metallic sheen. Another option is to create a gallery wall, featuring carefully arranged pictures or photographs, with frames that match or co-ordinate. This can give you a wonderful way to display some of your favourite family pictures or to showcase your favourite art-work, and can be a great way to add interest to a neutral colour scheme. 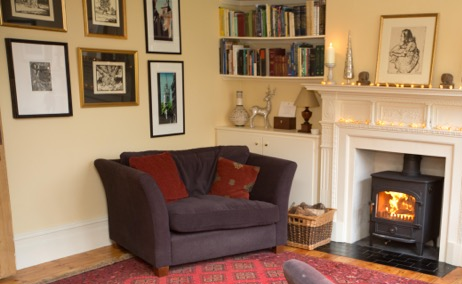 For example, this beautiful room has walls painted in a warm cream colour, which form the perfect neutral background for a gallery of favourite pictures, open shelves displaying books and ornaments, and a lovely fireplace. All of these bring colour and variety to the room. A&R Design has extensive experience in all kinds of refurbishment and interior décor. For a free quotation for your project, please call us on 0208 3676599. This entry was posted	on Wednesday, January 10th, 2018 at 7:58 pm	and is filed under Uncategorised. You can follow any responses to this entry through the RSS 2.0 feed. Both comments and pings are currently closed.